A newly installed 18-panel solar array at the Institute for Food farm produces enough power to run the irrigation system to water the crops. And, as if that’s not enough, it does so much more. “The solar array takes us one step closer to putting sustainability into practice on the farm,” said Peggy Shaffer, coordinator for the Institute for Food, professor of history and global and intercultural studies and affiliate in the Institute for the Environment and Sustainability. The next step is for the farm to be organically certified. 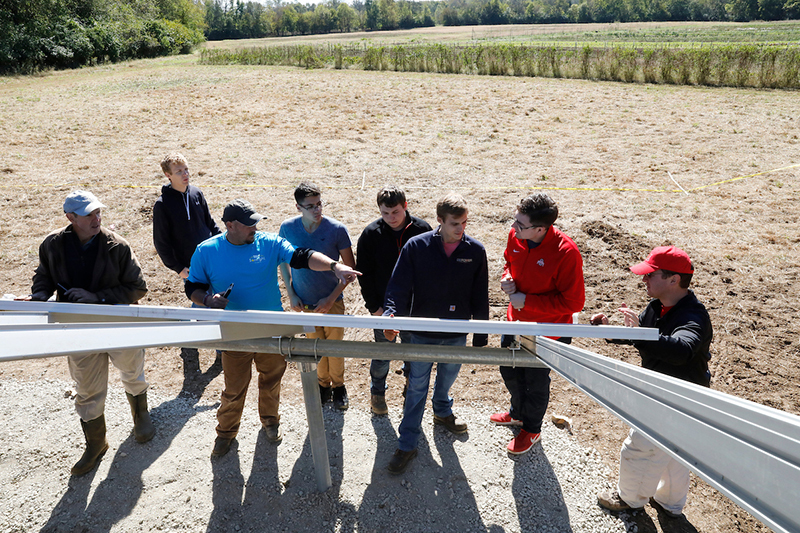 The 5.9-kilowatt array offers a big change from the gasoline-powered generator that was being used on the eight acres of fields at the university-owned, historic Austin-Magie Farm. 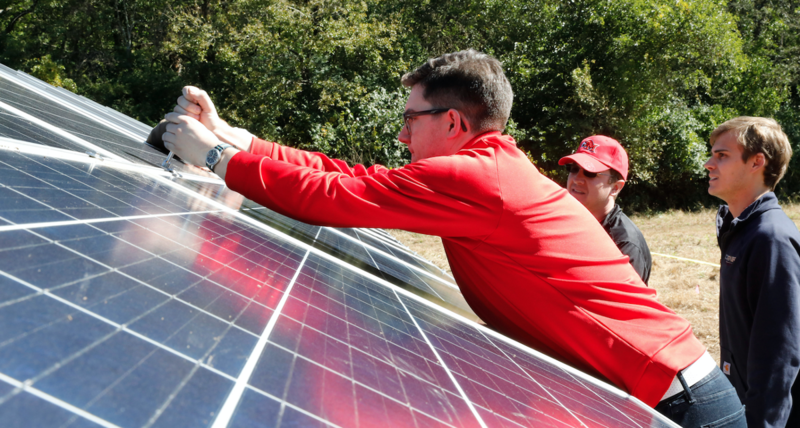 Harnessing solar power to operate equipment allows those working at the farm to accomplish all sorts of small tasks that couldn't be done before because they had no electricity. For instance, Charles Griffin, director of farm operations, can now tap solar energy to power the tools he’s using to build a fence around the array and expand a deer fence to encompass more acreage. He has set up lighting at the nearby array shed. And running the well pump provides water for irrigation as well as washing the food for the Community Supported Agriculture program, which goes through the last week of November, Shaffer said. “Those small efficiencies will save on labor every day and also help us increase production,” she said. They hope to use the array to power some fans in the hoop house (like a primitive greenhouse) “which will increase production potential by allowing us to have greater control over the temperature." On a recent fall morning when frost covered the fields, several people gathered at the farm to install the array. It culminated a two-year project that went through many iterations in order to meet state requirements. Mark Scott, assistant professor of electrical and computer engineering, called the project a great team effort. In all, about 10 students were involved as well as faculty, the physical facilities department and SonLight Power. 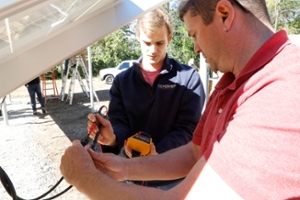 The Fairfield-based nonprofit specializing in solar installations played a critical role in working with the students who did the initial design, Scott noted. Joel Fellman, electrical engineer and project manager for Miami's physical facilities department, works with Ben Jackson (Miami '17). Joe Fellman, electrical engineer and project manager for Miami's physical facilities department, was instrumental in getting the project certified by the state. Sophia Fisher, a junior mechanical engineering major and member of Miami’s Engineers Without Borders chapter, helped dig a trench that was used to run the electrical wires from the solar panels to a small pole barn built to hold the batteries and inverter. “It is very exciting when projects get finished,” she said. Bailey Hall (Miami ’17), who is pursuing his doctoral degree in power electronics at Ohio State University, returned to help complete the job on his senior design project. He was joined by two former capstone classmates — Ben Jackson and Kyle Smith. Both alumni now work for CE Power in Cincinnati. The project took so long because the initial plan of using a donated shipping container for the mechanical space changed after state officials voiced safety concerns about the container’s wooden floor. It wasn’t known if anything had ever been spilled on it or if it may have been contaminated. That’s why they switched to a ground-mount array system and constructed the small pole barn for the mechanical space. The shipping container can be used for storage. Funding for the project was provided by a gift from Jeff Eckel, president and chief executive officer of Hannon Armstrong, a capital and services provider that focuses on sustainable infrastructure markets with the goal of reducing climate changing greenhouse gas emissions. Clay Luna with SonLight Power shows how to mount the panels so the entire array is flush and level. “Mr. 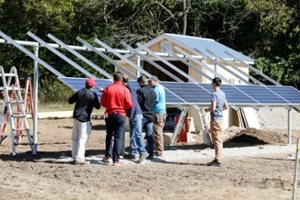 Eckel has given a multiyear gift, which in addition to supporting the solar power project on the Institute for Food Farm will also be used to establish an endowment to support experiential learning opportunities for our students interested in social impact and environmental sustainability,” Shaffer said. Additional funds for the project came in part from the department of biology and a U.S.D.A. National Institute for Food Capacity Building Grant. Shaffer — who estimates the array will save about $1,000 per year on fuel costs — said the project embodies the core mission of the Institute for Food. It is the product of engaged learning and collaboration among students, faculty, staff and community partners. It also combines technological innovation with issues of health and wellness and sustainable development bridging the key goals of Miami's Boldly Creative Initiative.